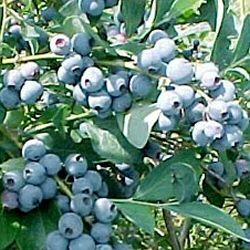 Bluecrop is the most popular of our various blueberry varieties on offer. This is because its fruits ripens in early to mid August. The fruits are large sized, light blue in colour. A fast-growing blueberry variety, Bluecrop has a very attractive taste, so a real must amongst the various varieties we offer. In terms of visual appeal, this variety of blueberry exhibits good autumn colour. A vigorous upright grower.